The last of our brief three days out to sea, tooling up and down the Atantic coast, is highlighted by some remarkable news. This morning at quarters Uittenbogaard (a first class perry officer who arrived to the sonar division in November while I was away cranking, so a stranger to me) let us know that Miss Kim (whom he calls “Princess”) only has a brief time left with us. To our surprise (one of the emotions felt) she is transferring next week to DCA school before heading to the Mason. I wonder how such things so quickly come to be. Wasn’t it only a week or so ago that she was saying she had until April? Yet, it must be real, because she took the time to email all us the proof: her orders out of here. Maybe it will be good for the division, maybe we will function better, but she also hasn’t been around enough to be a disruption (This is coming from me though, the shadow pseudo-member of CA sonar division). On the other hand, I think it is good to have a Nurse Ratchet character above us, because it does do something to foster unity. U.S.S. NICHOLAS— World leaders yesterday, in an emergency United Nations meeting, frantically debated the course of the Global War on Terrorism, now that a key cog in its success, Lt.JG Kim’s overseeing of the U.S.S. Nicholas’ sonar division, is no more. 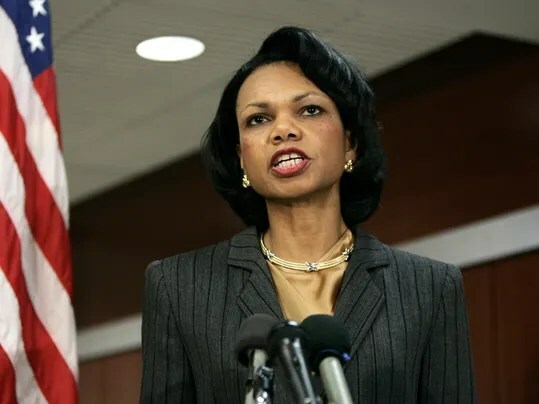 “We have discussed the withdrawal of all troops from the Middle East,” stated the new United States Secretary of State, Condoleezza Rice. Other delegates involved in the session were less certain of what new course to take. “The United States promised a full effort in fighting terrorism. What shall become of this pledge without Miss Kim at the helm?” A representative of the CA division, STG3 Rhea, spoke of his firsthand experience with the young, stalwart division officer. “What will become of us? Who won’t be around to tell us what we already know? Who will seem to spend as little time with us a possible? Game over, man.” It was not until late in the day that a representative of Miss Kim could be reached. “We thank the world for the support it has shown toward Miss Kim. And she would especially like to thank President Bush with the gift of lilies. Very thoughtful.” More information on this seismic shock to global affairs to follow, as soon as Miss Kim emerges from her stateroom. It never fails that coming back into port make us want to get as far away from the ship as possible, no matter the brevity of the underway. Owens and I dashed off the ship as soon as the brow was laid, with Nosker’s house as our destination. Owens called a girl named Sharon he had met at the Banque, a country dance hall that is a haunt of Nosker’s. Nosker drove us in his prized Dodge pickup to Ruby Tuesday, happy to have stable ground under our feet again, where we were going to meet up with this Sharon and her roommate Crystal, and Rhea for good measure. Eventually the girls showed up, and for some reason Rhea was in extra hyper mode, giving the waitress and everyone in general a hard time, perhaps because of the girls being there, and just having gotten out of his relationship with his longtime, land-locked girlfriend. But good news for me on this front. Marley, a girl I’ve gotten to know recently a little bit through writing emails, called me while we were waiting for our food, and she was all for setting something up on Friday, which I’m looking forward to because she seems different from most girls.